Sam Rennebohm, First Church Seminary Intern, shares his experiences of the march to the Port of Oakland that was part of the General Strike called by the Occupy Oakland movement on Wednesday, November 2. We marched into the port with such positive and life-affirming energy. As we walked through the port, people broke into celebration. There was dancing and singing and drumming, and people waved flags. There were also powerful conversations happening in small groups, people talking about their ideas and ideals with one another in passionate ways. All the while it was the sheer presence of so many folks that was causing the Port to have to shut down its operations. At one point in the evening, while we were blocking one of the gates to the port, two or three people got angry with a car that was driving by and started to bang on the windshield. A group of maybe 100 soon gathered around them and started chanting “peaceful, peaceful” with enough force to entirely change the energy. The people who were angry calmed down, and the crowd convinced them to let the vehicle drive away. It was an amazing indication to me that, even though there is no true center or established leadership here, the overwhelming (literally) majority are committed to non-violent methods. I left the Port around 9pm, and the energy was still very celebratory and positive. Even as we were piling into the BART, people were giving each-other high-fives and hugs and telling their stories. Reading the news-reports from the middle of the night, it saddens me to hear of what took place. It also convinces me of the importance of continued involvement in this growing movement – the importance of maintaining strong voices for the methods of non-violence. As I begin my day this Thursday, November 3, the day after the General Strike in Oakland, I am mostly experiencing frustration over what little media coverage I have scanned (mostly online). Reports are focusing primarily on vandalism and clashes between police and participants later in the evening. Little is being said about the scope of the march or its tone. 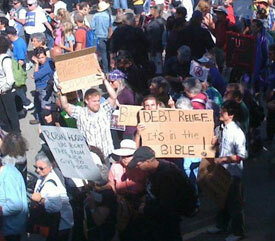 I went downtown both in the morning and later for the 5 pm march to the Port of Oakland. At that later time, I had intended to stay for a while, perhaps march for a bit and then return home. I ended up walking all the way to the port and back. 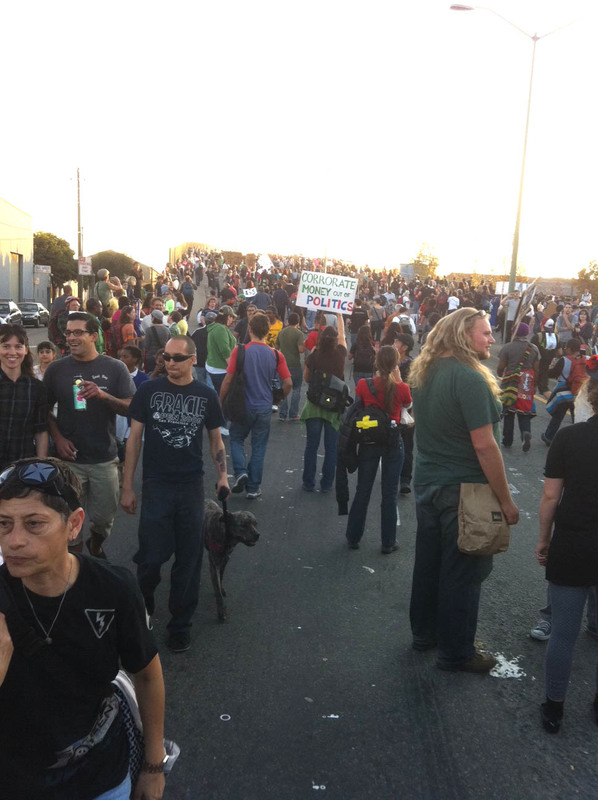 When I walked back to downtown Oakland which was still relatively early (7:30 pm) a group was gathered in the intersection at Broadway and 14th. I must say, I felt at that point I experienced a bit of dread, because I believe the possibility for conflict dramatically increases the later it gets. And this morning, I began hearing the reports of problems. This will always be the part of the story that the media leads with. I am a firm believer in non-violent protest and I see absolutely no value in the defacement or destruction of property. It seems a shame that the dynamics of public and political action and the attention they receive pivot precisely on that. The Occupy Oakland movement has both benefitted and will be harmed in this unfortunate equation. As a progressive person of faith, I believe that “the truth will set us free” and that the truth of any situation has many sides to it. I would hope to see a fuller truth represented in the media. Other stories and points of view on the activities in Oakland and the larger issues of the “Occupy Movement” are welcome. Email your thoughts to pporter@fccb.org.